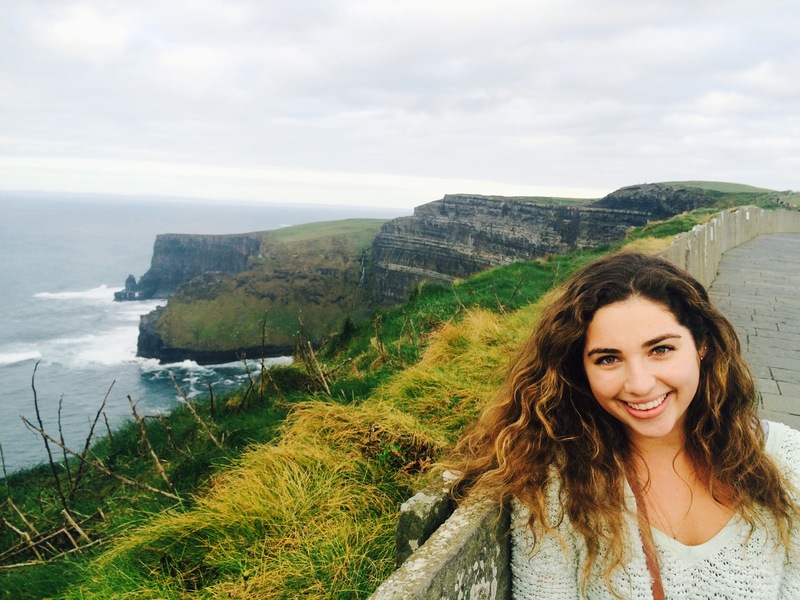 At the start of this epic adventure, it had been nine months since the end of my study abroad in London – it’s safe to say that my time living across the pond seemed like a far off dream. With my huge pack on my back and my carry-on strapped to my front, I hopped off the coach with my parents in tow in the center of Dublin, just outside Trinity College. Being that we all had no cell service to look up maps to get us to our hotel, I navigated us to the riverfront and along to the Clarence Hotel. All three of us were a bit giddy, because Bono from U2 owns the hotel – something about being in a rockstar’s hotel felt so special for our first couple of nights into this trip. After successfully leading us through the streets from memory, my time studying abroad began to feel more like reality. After a quick freshen up (because two flights and little sleep tends to make you feel a bit rough), we ventured out on the town. Our first stop was to the Dublin Castle, not much of a fairytale castle, but certainly stunning in its own way. The gardens directly behind the public entrance make for a nice place to gather your plans for the day while still being immersed in the city. Being Californians, we all had our flip-flops on, because after all it still was the middle of summer – of course, the weather made us look out of place. The rain that started to come down sent us looking for a nook to hide out in and grab some grub. We found ourselves back in one of my favorite restaurants from my visit there last fall, Porterhouse Pub, to have a late meal and watch the sky blaze bright pink with the sunset. With the advice from our friends back in California, we came across the Brazen Head – Dublin’s oldest pub – for a a delightful end to our first day in Ireland. Soon after, we made our way back alongside the riverfront to the hotel and crashed after a day of travel and touring. The town was alive, since it was a Friday night, but we could barely keep our eyes open any longer when the clock hit midnight. With the rays of sunshine coming in through our window, we woke up with a cup of coffee on our minds. Thanks to room service, we finally felt awake enough to get moving on our one day of touring around Dublin. Breakfast was found in an alleyway of Temple Bar, Queen of Tarts, a cute little bakery recommended to us by my mom’s all-knowing Rick Steve’s travel book. The day took us to the parks and places I had visited with my friends last fall, although this time around there was sunshine and a bit of heat, instead of the autumn cool winds. 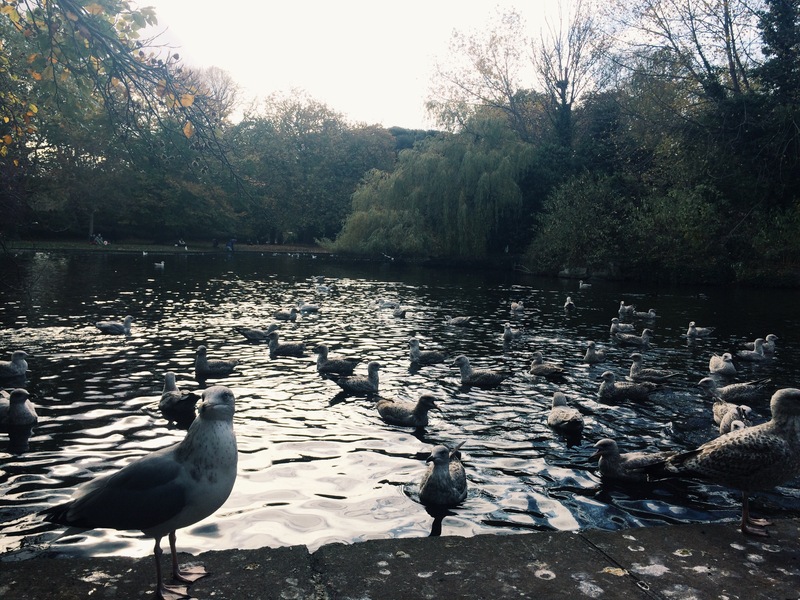 The last stop took us to Iveagh Gardens, a beautiful park that appears from the a side street. Last year when I came to this park, we were all tired and exhausted from a day of walking around, and this time was no different. We sat on the benches and relaxed while the locals played fetch with their dogs and enjoyed the crazy sunny day. While my parents and I came to Ireland together, they were continuing on from Dublin on the last train of the evening to Cork, where they would begin their bike riding tour of southwestern Ireland. However, with three hours until they had to leave for the station, we decided to get on a DART train to Howth, a small peninsula on the northern point of Dublin Bay. 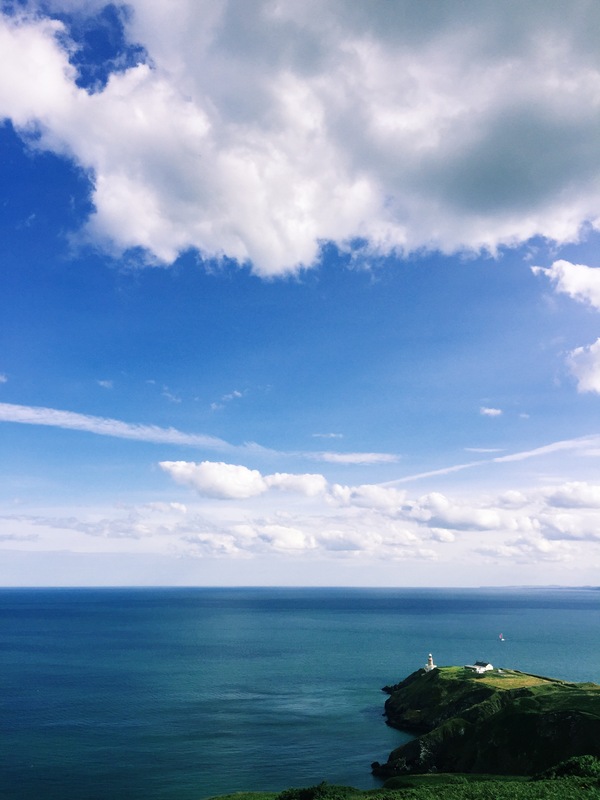 Because we just barely missed the train to Howth, we ended up only having about forty minutes to spend in this beautiful seaside town that looks very similar to the Marina district of San Francisco. 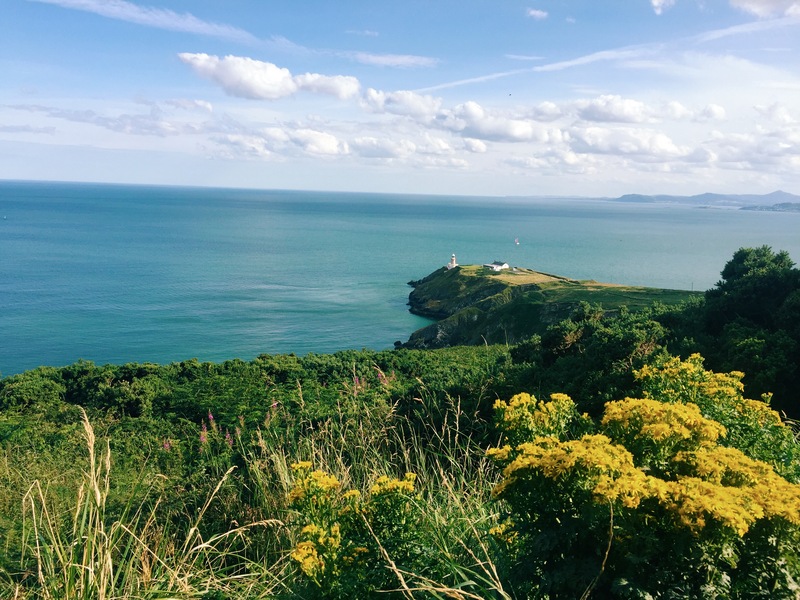 From other travel blogs, I’ve heard of the views from the top of Howth, however we just didn’t have an extra hour to walk up the twisty and turny road – so we flagged down a taxi to do the work for us. An older gentleman named Louis was our driver, who was absolutely delighted to take us on a quick tour of Howth, pointing out all the nice homes and views. He parked up on top and told us to hike down the path a bit for the best views of the lighthouse, and of course, he was right. The lighthouse sat delicately on the end of the peninsula, while the ocean winds blew around us. Our journey soon came to an end and we rejoined Louis back at the cab before heading back to the station. 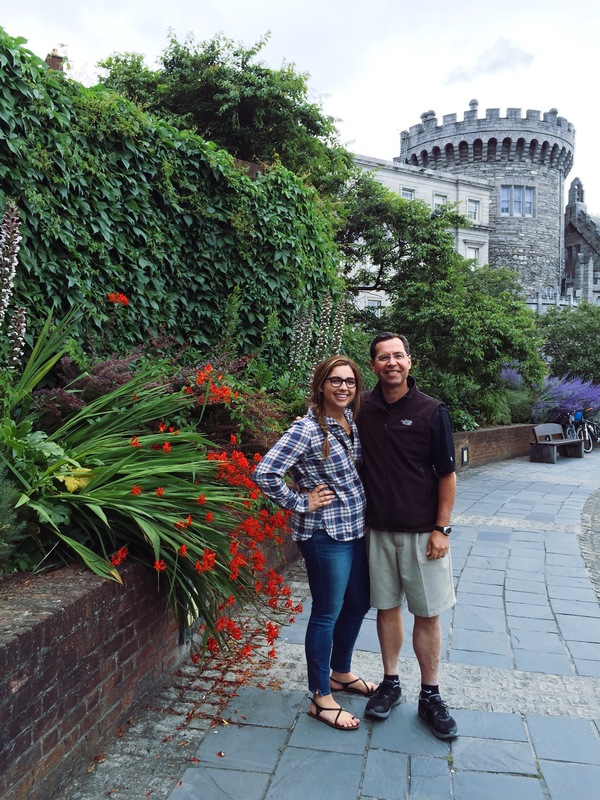 It was incredibly special to show my parents around the places that I had traveled on my time abroad, but so amazing to experience something new while back in Dublin. Just an hour later, my parents were off in a cab to the Heuston train station and I was on my own for the night in Dublin. I had a delicious meal in Bono’s restaurant, Cleaver, before indulging in the most refreshing early night, since I was off to London the very next morning. While I repacked my backpack (because a tidy backpack is much easier to sift through), I felt a bit of beginning of the trip jitters. Maybe it was the jetlag kicking in, or the fact that I was on my own for the first time in a while, but I knew that with the upcoming trip, my confidence for traveling would soon be coming back. The most cathartic way for me to deal with anxiety has always been through writing, because it’s almost like you’re expelling the weird feelings into the journal, to be left there and not bother you anymore. Whatever the anxiety stemmed from, I was soon exhausted and ready for a restful night before continuing on to London to be reunited with the all the wonderful people I met while studying at Kings College. Looking back five weeks later, I know that anxiety can be healthy at certain points, because without it, I wouldn’t feel the need to challenge myself on adventures like this – to prove that the world, while intimidating at times, is still quite incredible. I know that with each new experience comes times of discomfort, but the days still move on and so did this adventure around the world. I’m not so sure I agree with the list of the seven wonders of the world. Sure, the places listed are incredible and I truly hope to visit each and every one of them one day – but what defines wonder? The dictionary says “a feeling of surprise mingled with admiration, caused by something beautiful, unfamiliar, unexpected or inexplicable”. If wonder is taken as in this definition, then finding a place that elicits these emotions must be pretty personal. I’d say that there are a lot of places in my life that have caused me to feel full of admiration for nature. At age 20, my list of wonder-full adventures is already lengthy, and this most recent trip to western Ireland certainly earned a spot on the growing archive. It astounds me how rural parts of Ireland are. The drive to the other side of the country took us a mere three hours – you can’t even get across California in that amount of time. Throughout the rainy drive, there were pastures of cows and sheep, small cottages and very little traffic on the roads; then again it was around 8 AM on Tuesday morning. Our first stop was to Kinvara, a small fishing town in Galway Bay. This pit stop was only about 10 minutes long, because the town consisted of a few ships in the water, some closed shops and a little spread of houses in the surrounding fields. Regardless of the small amount of time we spent there, the views of the Atlantic Ocean were really beautiful. Clumps of seaweed floated along the coastline and a couple ships were sailing out to the ocean – this quiet, little town was full of wonder to me. About twenty minutes further down the Atlantic Way are the ruins of Corcomroe Abbey. When I think of ruins, I typically picture of old churches that are full of really old graves. This abbey was certainly old but some of the graves there were not from too long ago. The collapsed ceiling and the aged stone was shining brightly from the cloud covered sun. 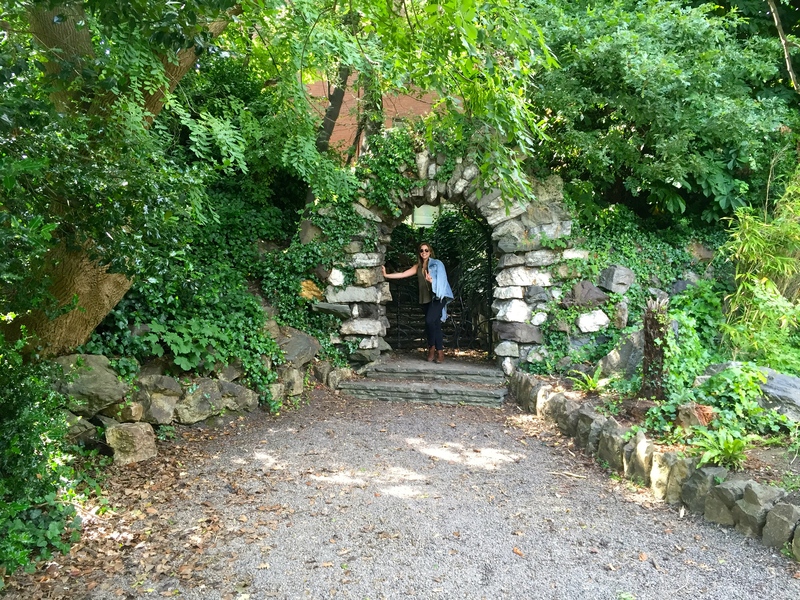 While walking around the abbey ruins, I found several little doors and windows that were so tiny and being ever-curious, I took it upon myself to climb through each and every one. Our tour group was fairly small, just around 20 of us exploring around the ruins. There were pastures just outside the gate of the abbey, filled with rolling green fields and not much else. Again, these vistas were making me realize just how rural western Ireland truly is. After living in the bustling London city center for a month and a half, these rural towns were so refreshing to be in. Getting away from the concrete jungle and finding a little bit of space in these towns. Especially in the grey weather, the vibrant green of the hills was illuminated even brighter – Ireland kind of reminds me of Washington in a way. It looks so beautiful in the dull weather that can sometimes drown a city. We went driving down the Atlantic Way a bit further through the colorful Burren landscape. It’s known to be full of smaller versions of the ultimate destination, the Cliffs of Moher. Sure enough on our stop off in this area, I walked right out to the cliffs and sat down to witness the depth of the sheer cliffs. One of my favorite views was the waves continually crashing over the rocks sitting out of the water. Salt water filled air is among one of the most refreshing feelings. The mist that was being sprayed up along the cliffs made the cool wind more brisk, so the fifteen minutes spent outside of the bus was just enough. The wind was whipping along the coast line when we arrived. There were hills rising next to the ocean that were void of trees and littered with large boulders. In fact, Burren (or Boireann in Irish) means ‘great rock’ and this massive landscape spans 250 kilometers across Ireland. The glaciers that once dominated the landscape, around 10,000 years ago, are responsible for the rocky grounds and the large boulders the area is named after. It’s well known for having colorful flora and fauna – hues of red, green, yellow and blue sprinkled along the vast views. After a lunch in the small town of Doolin, we made our way to the pinnacle of the day… the Cliffs of Moher! On my growing list of wonders, the impressive 700 foot cliffs along the Atlantic coastline certainly earned their spot. The pictures don’t do nearly enough justice of this incredible view. In a moment of true jaw-dropping astonishment, I hardly could speak. I’m even having trouble writing about this moment now, lost trying to find the right words so I can convey the sense of beauty I found in this place. Alongside the fenced pathway sat a pasture of Irish cows; they really do live in a small slice of heaven. 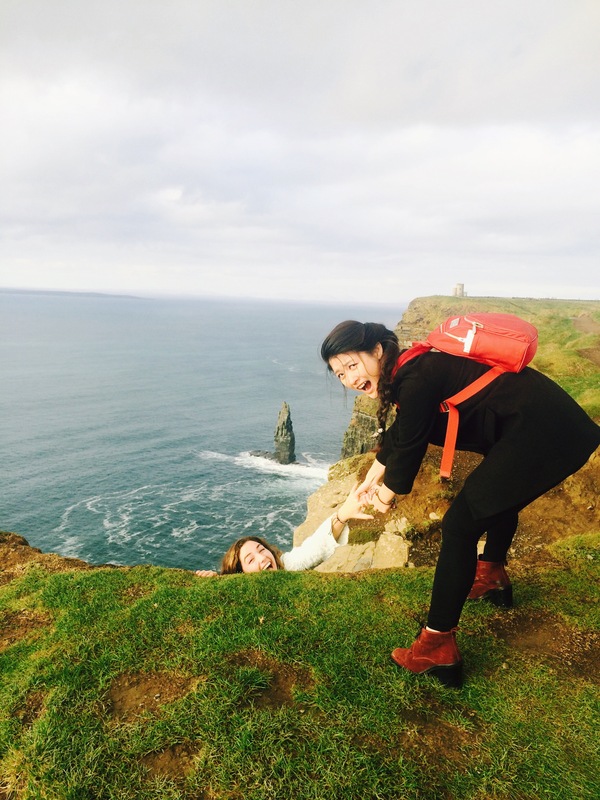 What would a day on top of Ireland’s famous cliffs be without playing a joke or two? After climbing over the gate that conveniently had a plaque memorializing the people who have died over the side of the cliffs, we dangled our feet over the edge and I fell a little bit more in love with the enchanting area. No need for the heart attack, there was at least three feet of ledge underneath me before the 700 foot fall. Despite the gut-dropping feeling when you’re looking at some pretty sharp rocks that far below you, the view was absolutely incredible. What places give you a feeling of incredible wonder? Let me know in the comments below! It’s so strange having a fall break this early on in the semester. Of course, I’m used to the first break of the year including a big roast turkey and pumpkin pie. With it being just the end of October, I guess a trip to Ireland will have to do. Ireland has been on the top of my travel list for a very long time. I’ve always wanted to visit the land of four leaf clovers and green as far as the eye can see. Despite the stereotypical idea I had in my head of Ireland, the time I’ve spent here has lived up to every expectation I had regarding this trip. Saturday morning had Hannah, Rebecca and I leaving Stamford Street for Heathrow Airport (at an ungodly hour for them, but just the morning for me). The tube was empty and we actually got seats for the hour ride to Heathrow Airport. A quick breakfast at the cafe and then on to the airplane, jetting towards yet another adventure. 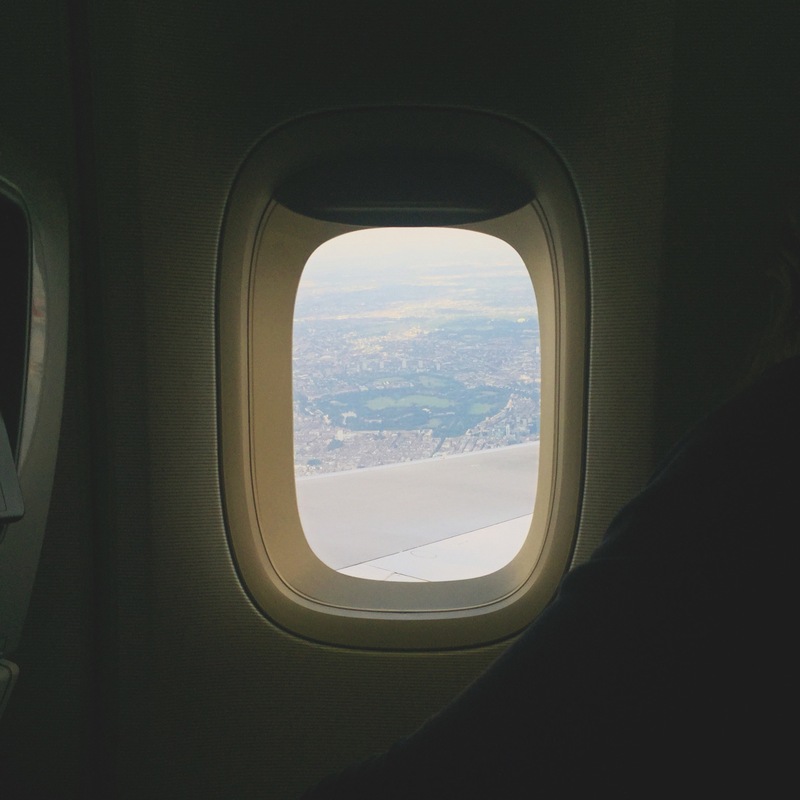 When we landed, we were so giddy with excitement and the customs officers were laughing at us as we cheered when another stamp marked our passports. We took the AirCoach bus to the city center of Dublin, for only 12 euro round trip – it was definitely easier on our wallets than the emergency taxi we took on our delayed Scotland flight. Hannah went running down the road when she spotted her friend and their reunion was so priceless…made for a movie, even. We had a great hot lunch at KC Peaches, across the road from Trinity College, before making our way to the area of Rathmines, where we were staying in a Travelodge hotel just across the road from Molly (Hannah’s friend from the states). A much needed pick-me-up coffee was at TwoFiftySquare, a cute little cafe around the corner from our hotel in Rathmines. Although the flight to Dublin was only 50 minutes, any day of travel makes me more tired than usual, and we had a night at the pubs ahead of us. Caffeine was an absolute must. I was prepared for a bustling nightlife that resembled London – but Dublin has a much more relaxed pub life. Sure there was the loud music, mingling groups and many “sláinte”s to drinks around the room, but it seemed more intimate and you were certainly able to simply talk with your friends if that was what you desired. On top of it all, the Irish guys were actual gentlemen – they were there to socialize and share a drink with their buddies (although that accent didn’t hurt much). Fast forward to 1 AM, when Dublin had daylight savings and I became confused when I left to go back to the hotel at 1:40 but got back at 1:10 – definitely took a while to notice. Come morning, I left the sleepy heads to their morning slumber and ventured for a walk into city center. I passed along St. Stpehen’s Green and Merrion Square as the parks were being unlocked and the city was waking up on the chilly Sunday morning. There’s something so refreshing about walking around when nothing is quite open yet. Seeing an area wake up teaches you a lot about the way it works – whether its busy or sleepy, young or family oriented. Dublin is so much smaller than London, in the height of the buildings, the amount of time it takes you to walk from one side to the other and the number of people living in it. My friends joined up with me at Trinity College, after I had done some souvenir shopping up and down Grafton street. 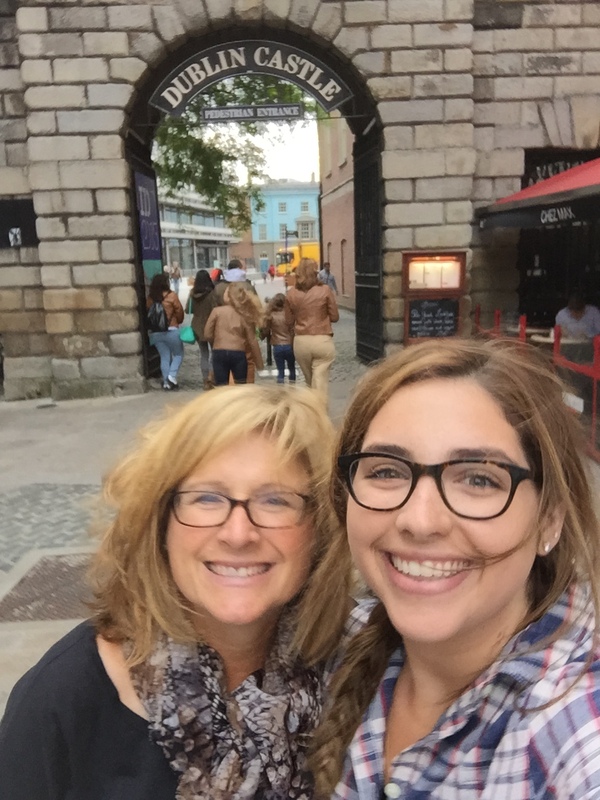 We took a short walk to the Temple Bar area, which is a young and vibrant slice of Dublin, and crossed the Ha’Penny Bridge, that separates the north side of Dublin from the south. Much like everything in London, everything in Dublin is very old and has seen so much history pass by. It’s still such a new concept for me to grasp – these bridges existed before the states had even declared independence… how strange. We took a bus over to the Guinness Factory at St. James’ Gate. Founded in 1759, Arthur Guinness had such a large vision for his brewery that he signed a 9000 year lease for the land. It was definitely worth the 14 euros to take a tour through the brewing process – the hops, barley, water and yeast that are used in crafting the perfect pint. Speaking of crafting a pint, we went up the fourth floor after learning how to properly taste the qualities of Guinness to take a stab at pouring a pint at the Guinness Academy. All three of us came out with a certificate…kind of reminds me of those participation trophies they hand out in recreation soccer; but no matter, because we did it! The day ended with a dinner at Portside Pub in the temple bar area for a traditional Irish lamb stew in front of live music being played by what can only be described as a rock flutist. Like no kidding, live flute and rock music combined. I had no idea that genre of music even existed. For day one of our reading week trip, it was pretty darn good. Little to our knowledge, we picked Ireland’s Bank Holiday weekend to come visit. Apparently the population of Dublin doubles during this weekend, as the marathon runs through city center and most of the smaller towns shut down for the day. I spent a few hours in the morning catching up on some journaling in the cafe down the road and by the time I was caffeined up, the sleep head brigade was waking up and ready to go explore. We made our way back to Grafton street in search of Claddagh rings – traditionally worn as wedding bands symbolizing love, friendship and honor, and now more commonly worn. It’s been an item on my list for a while; to purchase a Claddagh in Dublin – really can’t get more Irish than that. 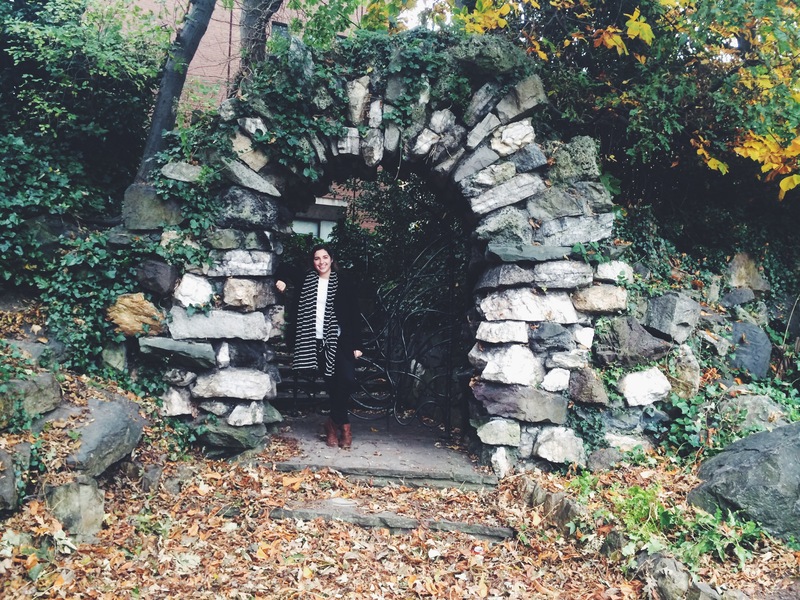 With hot chocolates in hand, because dang Dublin is cold, we made our way through the Iveagh Gardens. It was the perfect spot to spend some time outside when most of the shops were closed. There were a few statues throughout the park and locals were walking through with their dogs and enjoying the bank holiday outside. For the first two days of our trip to Dublin, I would vote it as pretty successful. Dublin is an enchanting city – small yet busy. Our trip continues with a day trip to Western Ireland, so keep an eye out for the update this weekend! Each trip I take makes me fall a little bit more in love with living abroad. I’ve learned so much about what I want out of adventure from these 6 short weeks – hopefully it won’t be too long until I’m moving back a little more permanently.